Erica Turgeon, 16, a student at Duchess Park and member of the Prince George Track & Field Team, demonstrates how to throw discus. Erica Turgeon, 16, a Duchess Park student, demonstrates the discus during the celebration hosted by the Prince George Track & Field Club Sunday as they reclaim Masich Place Stadium as their place of practice after the $4.8 million in renovations have mostly been completed. The grand opening of the stadium will be held Friday, Sept. 21. Former PGTF member Sarah Beaudry heading to the Olympics this year! Prince George is sending two athletes to the Olympics in the same sport. Biathlon Canada made a Tuesday morning announcement revealing its men’s and women’s competitors for the 2018 Pyeongchang Winter Games. Hometown P.G. women Megan Tandy and Sarah Beaudry were on the roster. The full list includes Brendan Green, Christian Gow, Macx Davies, Nathan Smith and Scott Gow on the male side; Tandy, Beaudry, Rosanna Crawford, Emma Lunder and Julia Ransom on the female side. Canadian biathletes are having, as a group, some of the best results in history, making the 2018 Games a highly anticipated event for the national team. For Beaudry, 23, it is her first trip to the Olympics, after a standout couple of years graduating from the junior circuit in 2015 and continuing her ascent of the rankings. “Sarah Beaudry was the first Canadian woman to win a world junior biathlon medal in 2014 when she took bronze in the pursuit. She made her world championship debut in 2016,” said a statement from Biathlon Canada. Tandy, 29, is one of the country’s veteran leaders for biathlon in this, her third Winter Games, with strong past finishes to her credit. “At her first Games (2010 in Vancouver-Whistler), she was the first Canadian woman to compete in the Olympic pursuit event (and) ended the Games as the top-ranked Canadian female biathlete. Her highlight at Sochi 2014 was being part of Canada’s best-ever eighth-place finish in the women’s relay,” said Biathlon Canada listing some of her career highlights. PRINCE GEORGE – 13 year old Simon Nemethy captured three gold medals to lead the way for the Prince George Track and Field Club at the BC Junior Development Track Championship in Surrey. The weekend event was the provincial championship for athletes aged 9-13. The Vanderhoof athlete who runs with the Prince George Track Club captured top spot in the 2000m run and continued his winning ways by grabbing the gold medal in the 600m and in the 1200m. He also placed 5th in javelin and 7th in discus. Two other medals were won by Prince George Track and Field athletes. Max Schonewille (Shown-willy) had an impressive throw of 31.18 metres to finish third in the 13 year old boys javelin while Morgan Weibe shaved 30 seconds off her previous personal best to win the bronze medal in the 9 year old girls 1,000m run. Sylvia and Olivia Masich also participated in the Provincial JD Championship gaining some valuable experience. 13 year old Sylvia cracked the top ten in hammer while 10 year Olivia made the top ten in high jump. The 2014 Canadian Legion Youth (16 and under) Track & Field Championships take place August 15-17 in Langley and it is expected that a few Prince George Athletes will participate after making the national standard to qualify in the open category. PRINCE GEORGE – Prince George Track and Field Athletes captured a number of medals for Zone 8 at the BC Summer Games in Nanaimo over the weekend. 15 year old Shelby Jansen picked up two medals, a silver medal in the 300m dash and a bronze medal in the 4 x 400 relay. The other athletes on the third place relay team were Lindsay King of Prince George along with Avery Drew and Olivia Baptiste both of Quesnel. 14 year old Kendel Rogers picked up the other medal at the track capturing the silver medal in girls’ pole vault with a personal best jump of 2.40 metres. Amanda Heinze of Prince George finished the Summer Games off in style as the 14 year old was named the Zone 8 female winner of the $500 scholastic bursary from Coast Capital Savings. The young Prince George athlete can use the funds for future academic pursuits. Sixteen track athletes represented Zone 8 in Athletics at the BC Summer Games with many of them achieving personal bests and cracking the top 10. The athletes were coached by Bill and Corine Masich of the PG Track and Field Club. The next major meet for the Prince George Track Club is the BC Junior Development Track and Field Championships (aged 9-13) next weekend in Surrey with a couple of PG athletes set to attend. There will also be a few local athletes heading to the Legion Youth Track and Field Nationals next month in Langley. PRINCE GEORGE – Prince George Track and Field Athletes captured 23 medals at the Annual Jack Brow Track and Field Meet held last weekend in Kelowna and 5 of those were gold. 13 year old Simon Nemethy of Vanderhoof who competes with the PG Track and Field Club led the way with four medals, three of which were gold. The young Nemethy continued his strong season by claiming top spot in the 2,000m, the 1,200m and the 800m runs. Meanwhile his 17 year old brother Alex won a pair of silver medals, finishing second in the 2000m steeplechase and the 3000m run. The other gold medals were won by 18 year old Carly Frenkel who finished first in women’s discus and 14 year old Kendel Rogers who won the midget girls pole vault. Frenkel also grabbed silver in the triple Jump and hammer throw and added and a bronze in the long jump. Other multiple medal winners included 18 year old Kirsten Ward who picked up a silver medal in the 100m dash and javelin and a bronze medal in the 100m hurdles. 11 year old Cassidy Campbell captured three silver medals finishing second in the shot put, discus and javelin and 9 year old Morgan Wiebe won bronze in 600m and 1000m run. Taigan Wheele claimed silver in the 12 year old girls 100m dash. In the BC Masters Championships which was held at the same time, 56 year old Brian Martinson won two gold medals and a silver medal after he took top spot in the 3000m and 1500m runs while finishing second in the 800m run in his age group. Meanwhile 53 year old Brian Nemethy of Vanderhoof won gold in the 3000m and claimed the silver in the 1500m run in his age class. 50 year old Brad Frenkel was also competing under the PG Track and Field banner and was first in both discus and hammer-throw for men 50-54. Two dozen athletes from the Prince George Track and Field Club competed at the annual Kelowna meet. The next major meet for the club is the BC Jamboree Track Championships for midget and youth athletes July 11-13 in Kamloops. PRINCE GEORGE – 13 year old Simon Nemethy of Vanderhoof picked up six gold medals and one silver medal to lead all athletes at the Annual Spruce Capital Track and Field Meet held over the weekend at Masich Place Stadium. The Prince George Track and Field member took top spot in 300m, 800m, 1200m, 2000m, High Jump, and discus while finishing second in the javelin. Simon’s Dad, Brian Nemethy also had a good weekend winning four gold medals including capturing the Annual Father’s Day Mile. 9 year old Caleb Emon, 10 year old Cole Laing, and 11 year old Rohan Soares also captured four gold medals. On the girl’s side, 11 year old Lisa Panko had a busy and successful weekend winning seven medals including two gold, two silver and three bronze. Meanwhile 12 year old Taigan Wheele won five gold and one silver. Other multiple gold medals winners included 12 year old Erica Turgeon and 11 year old Casidy Campbell both of whom won four gold medals. Prince George Track and Field Athletes picked up 175 medals in winning the top team award. Athletics North finished second in the team standings followed by the Nisga’a Track Club. The Spruce Capital meet was the qualifying event for the BC Summer Games which will be staged next month in Nanaimo. The next major track and field meet of the season is the Annual Jack Brow Track and Field Meet at the end of the month in Kelowna. 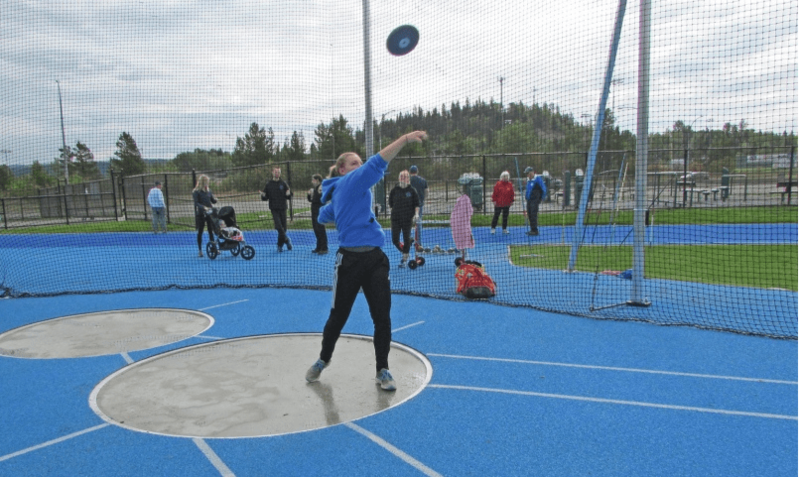 PRINCE GEORGE – Prince George Track and Field athletes captured 22 medals including 14 gold at the Annual Kamloops Centennial Track Meet over the holiday weekend. 18 year old Carly Frenkel led the way as she took the gold in long jump, triple jump and discus. 69 year old Tuomas (Tomas) Ukonmannaho (U-ko-mann-a-ho) also won three gold taking top spot in the 100m, 200m and pole vault. Double gold medalists included 19 year old Zac Matyas and 55 year old Brian Martinson who both finished first in the 800m and 1500m in their respective age classes. 11 year old Casidy Campbell also won a pair of gold medals winning the discus and javelin. 18 year old Sinead O’Callaghan took top spot in the 100m while finishing second in the 200m dash. The other gold medal was won by 14 year old Kendel Rogers in midget girls’ pole vault. In other results, 12 year old Tanner Matheson picked up two silver medals in the 100m and shot put. 14 year old Lindsay King won silver in the 200m hurdles while placing third in the 300m dash. 14 year old Amanda Heinze nabbed a silver medal in javelin while 17 year old Duncan Render also picked up a silver medal after finishing second in the discus. Sylvia Masich meanwhile won the bronze in the girls’ 13 year old javelin. Fourteen PGTF athletes attended the Kamloops meet. The North Central Zone High School meet is scheduled for this Thursday and Friday at Masich Place in Prince George. PRINCE GEORGE – Close to 180 athletes from across the north took part in the Sub Zero Track Meet held at Masich Place Stadium over the weekend. It was the opening meet of the outdoor season for the Prince George Track and Field Club. There were athletes from Williams Lake to Mackenzie and from MacBride to Prince Rupert. Among those that fared well was 14 year old Colburn Pearce of the Prince George Track and Field Club who was first in 100 meter, 300 meter, long jump, and triple jump. Meanwhile 10 year old Cole Laing of the Prince George also picked up four first place finishes winning the 100 meter, 600 meter, long jump and shot put. On the girls side 18 year old Carly Frankel, 14 year old Lindsay King, and 13 year old Taigan Wheele all picked up three first place finishes. Meanwhile in team results, the Prince George Track and Field Club, with the largest contingent of athletes took the most points followed by Williams Lake. Athletics North of Prince George was third in team points. The club`s major track meet of the season is the Annual Spruce Capital Meet which is scheduled for June 7-8 at Masich Place Stadium. Good luck to all the PG runners set to participate in the annual event! PRINCE GEORGE – PGTF Alumni Wayne Phipps, who is the Track and Field Coach at University of Idaho, guided his men’s track team to the Western Athletic Championship over the weekend. Phipps was also named Coach of the Year. The Idaho men claimed the Western Athletic Conference indoor title Friday in Moscow, beating Grand Canyon by one point. Meanwhile, at the Kansas State Open, PGTF Alumni Alyx Treasure tied an indoor personal best that ranks seventh-best in Kansas State history. Battling back from injury for most of the season, Treasure had her best performance to date, as she placed first in the high jump with a mark of 1.83m. For the All-American, her latest effort tied an indoor personal best that ranks seventh-best in K-State history. The Prince George Track and Field Club is pleased to announce that Bill Masich has agreed to be the club’s new Head Coach. The 45 year old Masich is well known in both local and provincial athletics and will help build on the already proud history of the club as it continues to celebrate 40 years of excellence. Bill is a former board member with the club and a former member of the BC Athletics Board of Directors. “Bill brings with him a wealth of experience that will help us develop our program and give our athletes the advanced training that will allow them to excel,” says Brian Martinson, Club President. “Bill, along with our sprint and hurdle coach Cathy Johnson will be of immense value in building on that tradition.” Johnson is back for her third season to share her experience from her extensive track career which included competing for Ohio State in U-S College Track and Field and on behalf of Canada at the Pan-Am Games. The club is currently running its indoor conditioning program at UNBC’s Northern Sports Centre and will begin its outdoor season in early April. A number of club’s athletes will be at an indoor meet in Kamloops this weekend. Main registration for the outdoor season will take place March 1& 2 at the Active Living Market at Pine Centre Mall. The Track and Field Club and other users of Masich Place Stadium are calling on the City to prevent further deterioration of the facility. During a presentation to City Council the track club requested that Council include funding to resurface the track in the 2014 Capital Plan. First built in 1990 for the BC Summer Games, the track was resurfaced in 2000 but hasn’t been resurfaced since. The cost is estimated to be about $400,000. “If you wait too long and have to fix the foundation that cost could double,” says club founder Tom Masich. “We are disappointed that it doesn’t appear resurfacing will occur this year but appreciative that Council has at least asked staff to look at the issue. Hopefully it will be done in 2015 to restore what was once the premier outdoor sports stadium in the city,” says Martinson. The track club was also joined by representatives of Soccer, Football and UNBC Athletics in calling on the City to look at ways to improve the infield including consideration of an artificial turf. Weed infestation and damage to the irrigation system has resulted in significant deterioration of the natural grass infield. “Having an artificial turf field would allow us to have a longer season and to hold a Provincial playoff round as currently, to host a playoff game an all-weather field is required,” says Duchess Park Coach Mike Rositano who is the Northern Board rep for BC High School Football. “We are very eager to start talks that might result in improvements to Masich Stadium.” With over 300 players using the facility throughout the season, High School Football is one of the largest groups using Masich Stadium.